Any quantity only $3.39 per oz over spot! The nation of Canada will spend 2017 celebrating 150 years since it began its Confederation process, cobbling together a collective governance of provinces that has grown over time to become the modern nation of Canada. The Royal Canadian Mint celebrates this moment in style with multiple coins for sale, including a commemorative design from 1935. Right now, 2017 1 oz Silver Canadian Voyageur 150th Anniversary Coins are available to purchase online at Silver.com. Features the design of the 1935 silver dollar! Mintage limited to 250,000 for this release! Voyageur design of fur traders on the reverse. Each 2017 1 oz Silver Canadian Voyageur 150th Anniversary Coin in this listing is in BU condition. Coins in BU condition exhibit no signs of wear and tear, though you may notice a variety of minor flaws stemming from the coining process at the mint. These include breaks in the luster, spotted surfaces, and contact marks. Additionally, these Silver Canadian Voyageur coins ship to you sealed inside of a protective plastic card. This card has the assay figures printed on the back, including the purity and guaranteed metal content found within the coin itself. Designed by artist and sculptor Emanuel Hahn in 1935, the Voyageur design on these coins first appeared in that same year on the inaugural release of a silver dollar coin from the Royal Canadian Mint. It was struck to honor King George V’s Silver Jubilee and was in circulation from 1935 to 1986. 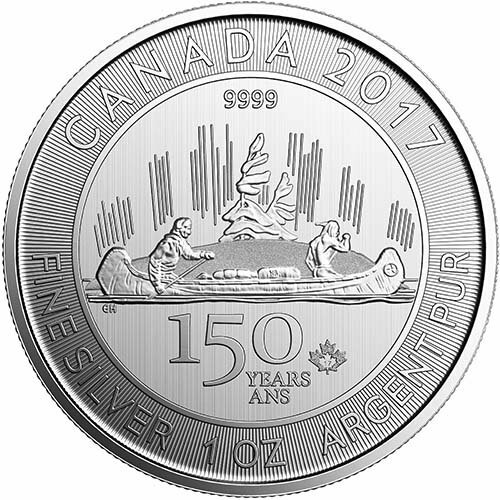 The reverse of the 2017 1 oz Silver Canadian Voyageur 150th Anniversary Coin includes the Hahn creation. It features two man paddling down a waterway in a canoe. In the back is a European settler, known as the Voyageur, paddling as a First Nation tribal member serves as his guide pointing out fertile regions for the fur trade. 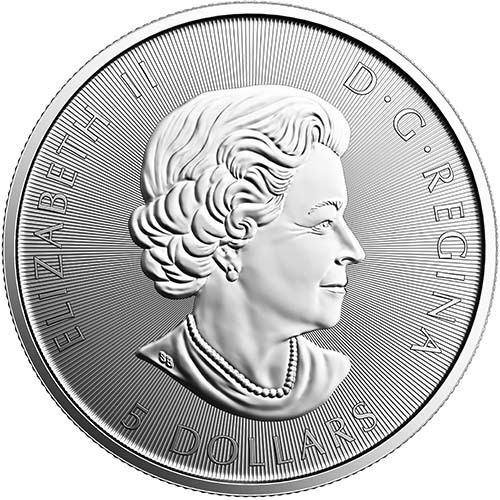 On the obverse of all Silver Canadian Voyageur Coins is the image of Queen Elizabeth II. Her Majesty’s effigy is captured on this coin by Susanna Blunt. Created in 2003, this is the latest portrait of the Queen to appear on Canadian coins. Blunt is a well-known artist and sculptor in Canada. The Royal Canadian Mint is the official sovereign mint of Canada. Founded in 1908 with a facility in Ottawa, the federal capital, today it boasts a second facility in Winnipeg as well that opened in the 1980s. If you have any questions, please feel free to ask. Silver.com customer service is available at 888-989-7223. We’re also available online through our live web chat and email features. Don’t forget you can check today’s silver price any time on our website!